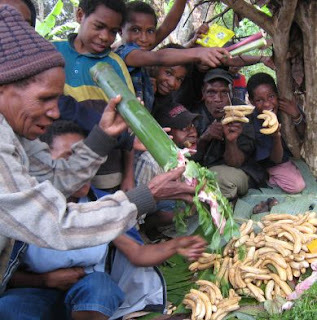 A mumu is a special PNG way of preparing food. The term is also used to refer to a feast, since a mumu is usually done on occasions such as weddings, funerals, and various celebrations. 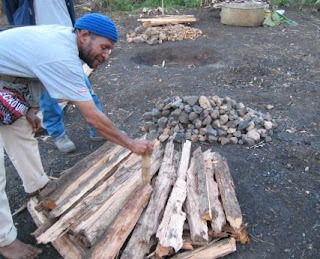 A pit is dug in the ground, and large stones are heated with fire until they are very hot. 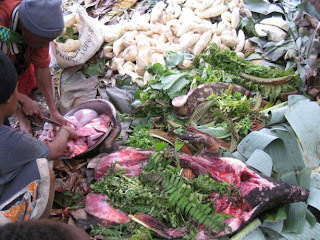 The stones are put into the bottom of the pit, and then layers of food and banana leaves are piled on top. The whole thing is then covered up with leaves, and water is poured on the hot stones, causing the food to be cooked by the steam. You can cook just about anything in a mumu pit. Several pigs were butchered for this celebration (a baptism and confirmation service in the local Lutheran church), but they also bought cartons of “lamb flaps” (lamb ribs) in town. 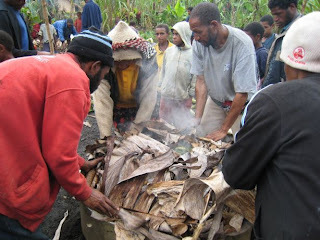 They cooked them with sweet potato, cooking bananas, pumpkin, corn, and a variety of local greens. Sometimes meat and greens are stuffed into a bamboo tube and cooked. 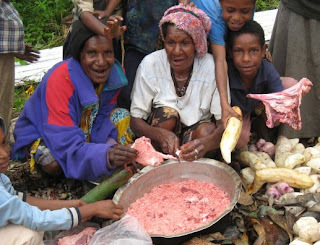 These ladies are preparing a special delicacy – tapioca mixed with pig’s blood! Does this pig's blood get cooked at any time? That might just be my limit. Everything else sounded delicious!